The Ranty Highwayman: We Want Kerbs, Not Technology. We Want Kerbs, Not Technology. There must be money to be made of out technology for use on our streets or for users of our streets otherwise people wouldn't keep pushing it. There's always a new and better design for indicators for bicycles but which one never sees out in real life, photo-voltaic carriageway surfaces which only ever exist on a test track and gyroscopic buses travelling above the traffic-snarled streets. What is it about the fantasists who promote these and perhaps, more worryingly, the fools taken in by the snake oil - is it because Shelbyville has a monorail? For walking and cycling, there isn't an awful lot of technology that could make the experience better, although I'll give you modern materials and e-cycles I suppose. 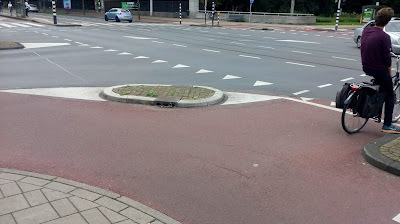 At its basic level, simply using kerbs and asphalt in the right places, amounts and layouts is all we really need and anything else becomes a coping mechanism when interacting with motor traffic because after all, the only reason for traffic signals is to manage interactions with motor traffic! Look at the Netherlands. It is very common for road markings to be provided to act as a backup for a traffic signal failure - the photo below shows the line of give way triangles within a signalised junction. Of course, Dutch drivers are a good/ useless as those from any other country and so in the event of a failure, walking and cycling is going to be harder! Here in the UK, we are overdosing on SCOOT which squeezes every last drop of capacity at junctions for drivers, but struggles to deal with walking and cycling (so expect long waits). Apps don't keep people safe on the streets. Data might be helpful for planning projects, but pedestrian crossings get people across the road (yes, some involve technology, but that's to manage drivers). A clever marketing insight might inform your branding, but continuous footways and cycle tracks help make walking and cycling more comfortable over side roads will be all the advertising you need! Look, I'm not going to be out on the streets smashing up the spinning jenny any time soon, because after all, it would be so much more difficult to undertake design work without modern computerised surveying, radar detection of utilities, computer aided design and modern communications. But, at the heart of all this is the absolute necessity to throw around civil engineering materials and elements because that is how we'll modernise our roads and streets.